Have you prepared a plan for your family in the event of a dangerous wildfire? City Council was right to take the initiative in undergrounding power lines and poles. The investment is worthwhile. I am proud of the way our community helps homeless people. Would you support a general obligation bond for citywide undergrounding? Happy 2018, Laguna! What issue do you feel is the most important one facing our community this year? On a scale of 1 to 5 with 5 being the best, how would you rate City Council’s efforts since the last election? The congressional primaries are in June, and the top two vote-getters secure a spot on the November ballot regardless of party affiliation. Of the three Democratic candidates who live in Laguna Beach, who are you most likely to vote for? Should Stu News publish “Letters to the Editor” about national politics? Do you believe school administrators should carry concealed weapons on campus? Do you feel that public art in Laguna Beach should only be commissioned to Laguna Beach residents? Do you support the Orange County Board of Supervisors’ proposal to build temporary homeless shelters in Irvine, Huntington Beach and Laguna Niguel? Are you in favor of the possible school year calendar changes, as proposed by LBUSD’s special calendar committee? How often do you eat from restaurants in Laguna Beach for lunch or dinner, whether sitting down or ordering take-out? Local elections are right around the corner. 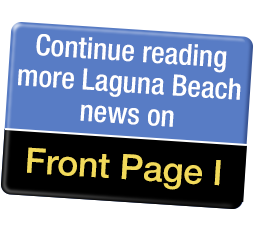 What do you feel is the biggest issue facing Laguna Beach right now, which council candidates must address?